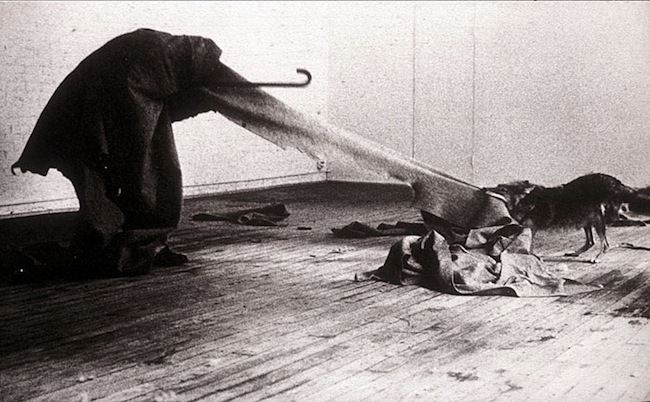 On September 12, the Moscow Museum of Modern Art opened its retrospective exhibition of the works of Joseph Beuys (1921-1986) – Germany's most notable artist of the second half of the 20th century. Part of the “Year of Germany in Russia 2012/13” cultural program, the exhibition “Joseph Beuys: Appeal for an Alternative” will run through November 14. On July 18, 1963, Joseph Beuys performed his first public “action” with fat, at the Rudolf Zwirner Gallery in Cologne, right after Allan Kaprow had finished his talk on “happenings”. Fat, felt and honey – the materials that became signature symbolic elements of Beuys' work – have an essential significance in both the semantic meaning of his work and at the level of his personal consciousness as an individual. In the case of Beuys, these two concepts are not mutually exclusive – he was the first who so explicitly moved the emphasis from what the artist creates to the artist's own persona, activities and opinions. 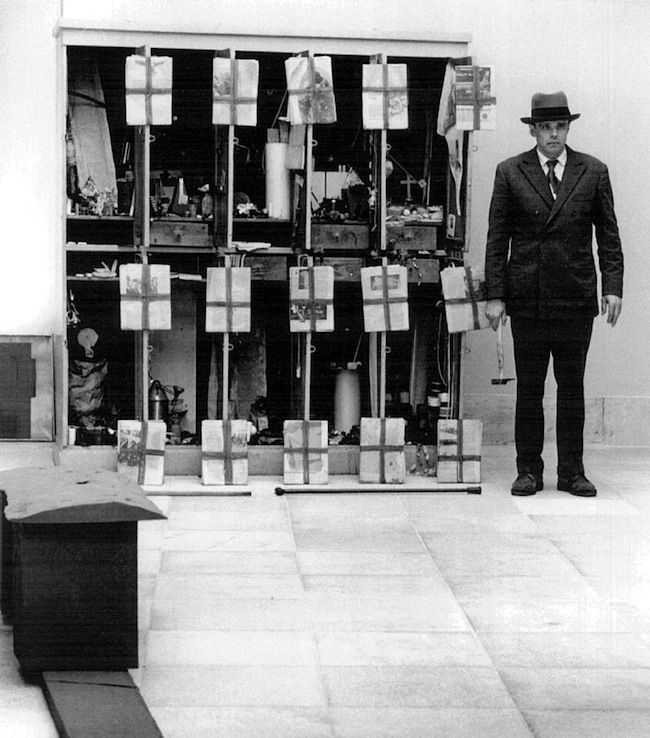 Beuys presented his expanded concept of art through performance series and public discussions. Today, materiality definitely stands out as one of the most prominent characteristics of Beuy's art. When speaking about his work, Beuys often mentioned “warmth” and “energy”, and the materials that he used in his sculptures are also associated with either the generation, storage or transfer of energy. To Beuys, this was a metaphor for creative and spiritual energy which, as he believed, must be prompted by art in every individual, as well as society as a whole. Beuys reasoned that the substances that he used in his sculptures and installations were semantically multi-layered and rich with associations which, when used repeatedly, acquired a personal symbolism. A controversial legend also played a hand in the symbolism of this materiality. Beuys revealed his war story to the public in 1979. After being drafted into the German army at age 20 in 1941, Beuys was trained as an aircraft radio operator, and became a member of various bomber units. On March 16, 1944, his plane came down in the Crimea, close to the village of Znamianka. This is all proven fact, but what follows is Beuys' interpretation of the ensuing events. Although witnesses attested to the fact that the pilot died shortly upon impact, it is known that Beuys was conscious when found by a German search commando. In addition, there were no Tartars in the village at the time. 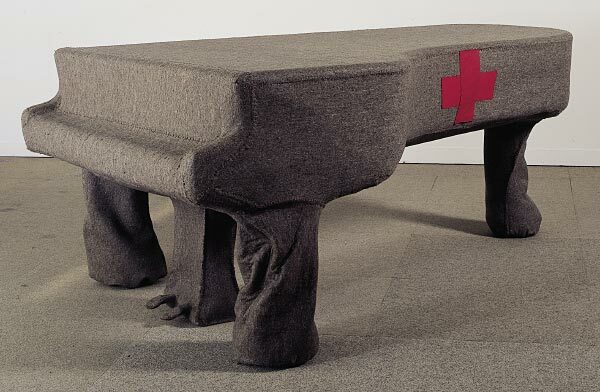 Beuys was taken to a military hospital, where he spent three weeks; in August, he was sent to the Western Front. This mixture of fact and fiction was a trait of Beuys' self-made personality, and this re-interpretation of his own biography was not necessarily in opposition to his art, as indicated by a much earlier event in his creative career. For a festival of new art held in 1964, at the Aachen Technical College, Beuys had made up an idiosyncratic CV called Lebenslauf/Werklauf (Life Course/Work Course). It was a deliberate retelling of the artist's life story, in which historic events were intertwined with metaphoric and mythical episodes. It should be mentioned that, at this same festival, Beuys created an “action”, or performance, that was interrupted by a group of students; one of the students attacked Beuys and hit him in the face. A photograph taken after the incident – of the artist with a bloody nose and a raised hand – was widely distributed in the media, and made Beuys a publicly recognized figure. However fictionalized the story about the plane crash and the Tartars may have been, it undeniably served as a powerful myth about the genesis of Beuys' artistic identity, and also provided an interpretative key to understanding his use of unusual materials – of which fat and felt were the most significant. Fat appears in many of Beuys' sculptures. He chose to use it, in part, to prompt discussion of how “a material very basic to life but not associated with art” can appear in art. Secondly, the flexibility of fat – how it changed from a solid substance into a liquid one at a certain temperature – allowed him to use fat as an effective symbol of spiritual transcendence. The significance of felt, on the other hand, was its ability to absorb everything that came in contact with it. Felt was an insulating material that became a symbol for warmth, as well as a silencer of sound when Beuys would wrap it around a piano, television or loudspeaker. Fat and felt were the most personal and “deepest” materials for Beuys, but two other “warm” materials that he utilized were honey and wax – which he saw as both spiritual substances and as something that represented political harmony. Beuys was amazed by the social organization of bees, and described them as a “socialistic organism” which functioned ‘in a humane warm way through principles of co-operation and brotherhood’. The artist also used metals, such as iron; Beuys associated the cold strength and durability of it with war, Mars, and everything masculine. Beuys placed iron in opposition to copper – one of the softer metals and a conductor of electricity, and which he associated with Venus and everything female. The use of gold indicated magic, alchemy and transformation. It could be that the legend about the Tartars bringing the dying radio operator back to life had some connection to Beuy's self-proclaimed status of shaman in art/life. Beuys believed that performance art can trigger a spiritual reaction in the viewer, making it a healing process. His performances, or “actions”, were like rituals that included powerful symbols of birth, death and transformation. Even his clothing had a ritualistic aspect to it – Beuys' standard “uniform” consisted of a felt hat, a felt suit, a vest and a cane. In childhood, Beuys was fascinated by nature, and he obsessively cataloged the surrounding flora and fauna. At the same time, he was spellbound by Northern mythology and folklore, in which all creatures possessed magical powers. Beuys never lost this reverence of the natural world, which could also be seen in his art. He identified himself with certain animals, believing that they were his totems: “The figures of the horse, the stag, the swan and the hare constantly come and go: figures which pass freely from one level of existence to another, which represent the incarnation of the soul…” In the 1970's, Beuys was active in the politics of environmental protection, and was one of the founders of the Green Party. “So when I appear as a kind of shamanistic figure, or allude to it, I do it to stress my belief in other priorities and the need to come up with a completely different plan for working with substances. For instance, in places like universities, where everyone speaks so rationally, it is necessary for a kind of enchanter to appear.” As Beuys often explained in interviews, he viewed and used his performance art as a shamanistic and psychoanalytical technique to educate and heal the public. “It was thus a strategic stage to use the shaman’s character but, subsequently, I gave scientific lectures. Also, at times, on one hand, I was a kind of modern scientific analyst, on the other hand, in the actions, I had a synthetic existence as shaman. This strategy aimed at creating in people an agitation for instigating questions rather than for conveying a complete and perfect structure. It was a kind of psychoanalysis with all the problems of energy and culture”.